Rainbow runner is a great mini game in which you dodge waves of blocks pushed up by pistons, much like a Guitar Hero game. This game was originally designed by Minecraftpg5, who creates many more incredible redstone contraptions, like his recent rapid fire TNT cannon. The aim of rainbow runner is pretty much to survive for as long as possible, as failing to dodge a line will mean you get pushed into lava above you. You can set your own rules and change the game to your own liking, for example, you could expand the amount of rows, set a specific time people have to survive or give people a certain amount of lives before they lose the game, by simply replacing the lava with something else. Although this mini game requires a lot of redstone, building it isn’t too difficult and only requires a basic understanding of redstone. It’s easier to build this mini game in different layers, working from the bottom to the top and then to the sides. I find it’s easiest to begin building the middle 2 rows. As you can see in the image below, all you need to build right now are 2 rows of redstone torches on top of blocks (in my case they’re on stone). My rows are 15 blocks long, but you can make it longer or shorter if you want. At the sides of each row are redstone repeaters, each without an added delay. 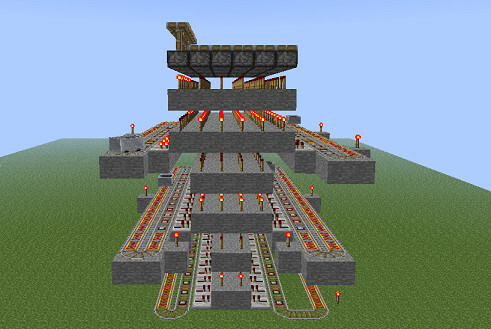 This repeaters are all connected to detector rails, which are part of a longer minecraft track which contains a lot of powered rails, which we need to make sure the minecart keeps riding. We will worry about a stop and starting mechanism later. Keep building up the middle rows by constantly placing redstone torches on stone and stone on redstone torches untill you’ve created 6 rows on top of each other. If you want a rainbow runner with 8 lines, build it up 8 rows high, if you only want 4 rows, build up 4 rows high. For every 1-2 rainbow dodge lines you add or remove, go up or down 2 rows in height, but make sure your height is always an even number. Next we expand the number of rainbow lines. Adding rows isn’t difficult at all. All you pretty much do is repeat step 1, but on different heights to avoid colliding minecarts and redstone circuits. Make sure you build each minecart track on the odd rows (first, third, fifth, etc). Building it on the even rows will cause the pistons to activate at the wrong times. Also remember to add lines of redstone torches to make sure the right line of pistons will be activated. 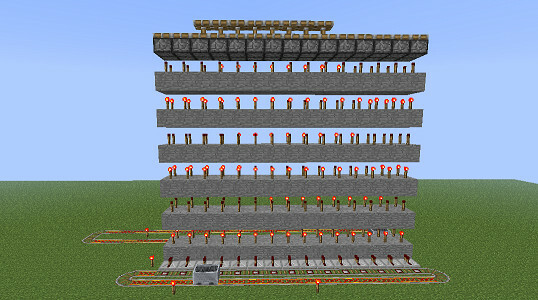 This pretty much means row 3 will be 4 lines of redstone torches wide, row 5 will be 6 rows of torches wide, and so on. As you add minecart tracks, you may already want to start with randomizing the sizes of the tracks a little. This is to ensure the rainbow rows you have to dodge don’t always came towards you in the same pattern. We will add upon this later in the article. Now that we’ve pretty much finished the rainbow part it’s time to build the part in which the players will stand and dodge the rainbow. All you really have to do is build a small booth with a 1 block wide line on top of the rainbow wool. Make sure the walls of this booth cannot be pushed up by the pistons below by removing the torches below it. It’s best to remove all the torches below it on all height levels, this will reduce any lag you may get from this mini game slightly, but every bit helps. However, make sure you don’t remove the torches directly beneath the rows the plater is standing on, as this is the mechanism that will push the player up and indicates if a player failed to dodge the rainbow. Add ladders 1 block above the wool the player will stand on and place lava on top of those ladders. Make sure the lava cannot flow anywhere, as this can be quite disatrous and annoying to repair. The lava will kill any player who fails to dodge the rainbow, as the pistons below will push the player up into the lava. If you don’t like this deadly result, you could replace the lava with other blocks or just air. However, note that using anything that isn’t deadly will usually mean a judge will have to be present to check whether the player really failed to dodge the rainbow or not. We also add an iron door, a lever (start stop button) and a pressure plate, which are explained in more detail below. We don’t want to let this mini game go on forever, partially because it’s quite noisy but also because it could cause a server to lag, especially when other larger redstone mechanisms are active. 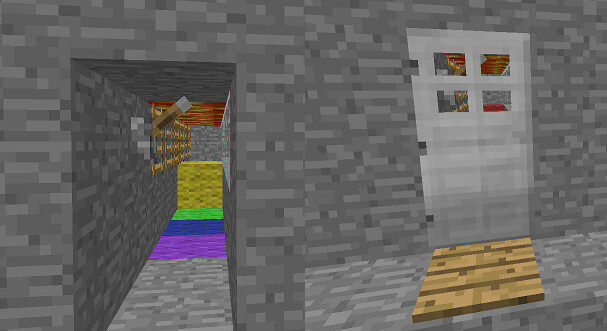 The lever in the player booth will both close and open the iron door from the inside, but it will also start and stop the game by locking the minecarts in place. The lever will activate corner pieces on all minecraft tracks, wich will cause the minecarts to ride up a ramp with powered rails. These rails are turned off, which is also done by the lever, which will slow down the minecart and keep it in place. Pulling the lever again will power those rails and turn the corner piece back in the correct position, however, if this happens at the same time, the minecart will go into the wrong position, which is why we add a repeater on a 4 tick delay to the circuit powering the corner piece, as seen in the images below. This power from the lever is transfered down by using a couple of redstone torches attached to floating blocks, with redstone dust on top of those blocks. Each block is placed below another torch, which continues from the top to the bottom. We’ve also placed a pressure plate at the door to make sure people can still enter if somebody decides to close the door from the outside by pulling the lever. Now we’ve pretty much finished everything, though you may want to expand some of the minecart tracks to randomize the way the rainbow lines come towards the player a little, if you haven’t done so already. Try to make sure none of the tracks are the same size, as this will mean those 2 rails will always come towards the players at the same times, which makes it easy for the players to time their moves.